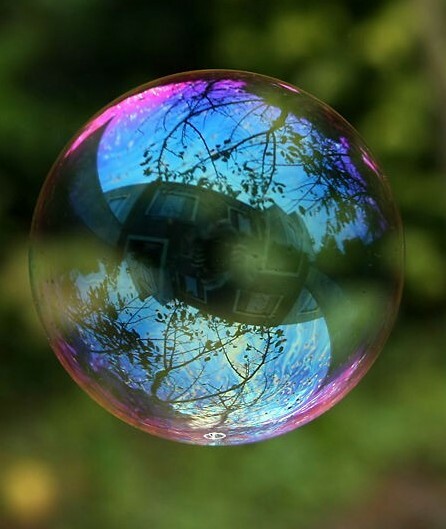 After starting to follow and participate in the innovation conversation, my impression is that, aside from its share of buzzwords, more often than not, the conversation appears to be happening inside an “innovation bubble”. As a technologist this is, unfortunately, familiar territory as it reminds me of the “technology for technology sake” trap that many large and also small companies fell victims of. When we talk about innovation as if it was its own entity without giving serious consideration to the core business and commercialization dimensions we are doing the same thing. Today, innovation, as well as technology, should be part and parcel of our core business and the way we work. Not an appendix. Definitely not their own bubbles. Some companies do get it. This is what I found particularly inspiring when I had the chance to listen to Peter Aceto (@CEO_INGDIRECT) from ING at the Business Innovation Summit. For them business, technology and innovation appear to be one thing. They also talk very clearly about the increasing need for transparency. For business, technology and innovation to be a part of a single vision and execution, we need a platform of transparency to build upon. Without transparency between departments and with the public, it’s much harder to get off our bubbles. As a side note, another parallel that comes to mind is the one of companies trying to find ways of being socially responsible by making charitable donations or sometimes creating separate foundations. Don’t get me wrong, donations and foundations are a good thing, but nothing replaces the core business being a socially responsible one in the first place. Being social responsible cannot be an appendix, it should be a part of how we conduct our business. Often in SharePoint 2010 implementations we see Portals, Team sites and Social sites being treated as separate conceptual entities. Although they have their own merits and add specific value individually, it is in “the intersection” where we find the ideal balance of flexibility, context and business alignment for open collaboration. Furthermore, in the intersection, the user experience allow us to easily flow between the different spheres and levels of formality. In the analogy, think of how the high gravity that exists closer to the sun and how it affects movement. The closer to the center the more rigid and formal everything is. By the same token, the further from the center, the more loose and disconnected things are. Rigid: portals managed centrally, typically by the communications department. Although too rigid for collaboration, they make for a good top down (tightly managed) communication channel where central control is important. Formal: departmental sites, managed in accordance to corporate structures. At this level, collaborations is structured and based on pre-defined groups. Mostly used to share managed documents at the departmental level. Regulated by the department and policies. Right Balance: not too structured not too loose. Governed by an evolving culture and guidelines. Although flexible to allow for non-anticipated types of collaboration and innovation (open collaboration), it is still connected enough to the enterprise goals and existing processes to produce tangible business value. This balance varies for each enterprise or organization. 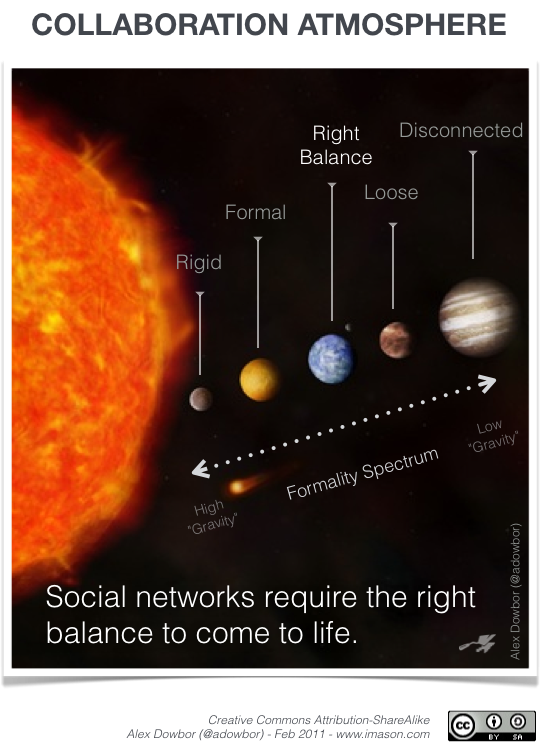 Loose: collaboration groups or initiatives that are still forming (emergent) and may flow towards mainstream by finding the “right balance” or drift towards the disconnected oblivion. Disconnected: so loose that it becomes disconnected. 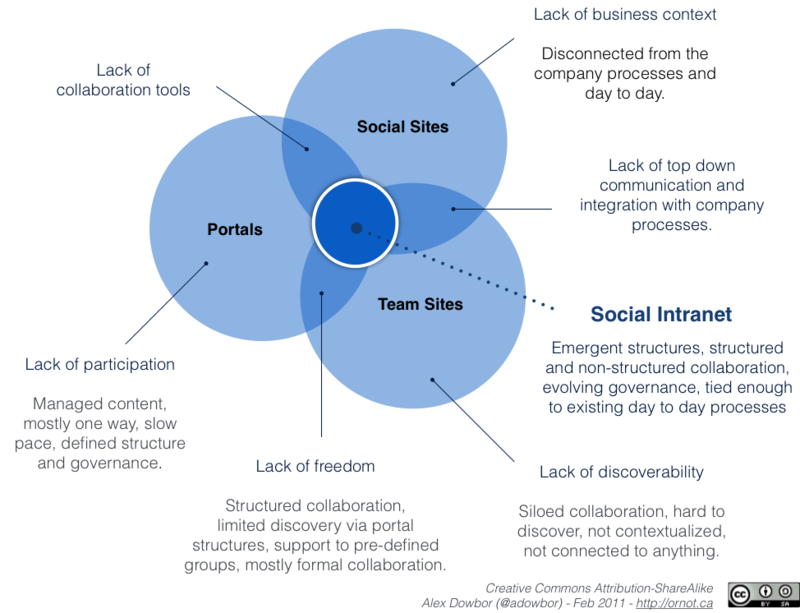 This includes the sprawl of collaboration sites that are disconnected from each other and at times from the organization as well. Although benign in small scales when it grows it aggravates problems such as data duplication, data quality and collaboration silos. Typically no policy, no guidelines and no visibility.